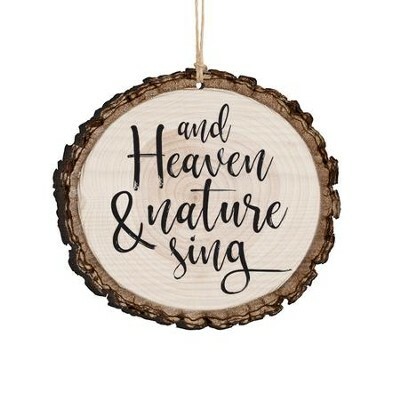 Barky ornament with the look and feel of an actual sliced log featuring typography message, And Heaven and nature sing. 3.5" x 3.25" x 0.25" on twine for hanging; laser cut to create a natural bark looking edge; design is on both sides. Made in the USA. I'm the author/artist and I want to review And Heaven & Nature Sing, Bark Ornament.